There are different types of glamping. Some people prefer comfy yurts and tents, while others stick to RV's and cabins; others still enjoy the DIY approach of transforming a regular old campsite into something straight out of a luxury magazine. That's how we roll. There’s nothing wrong with adding a dash of comfort to your otherwise-rugged campsite, but here at Glamp-Ed, we go big or go home. If it’s not over-the-top Instagram-worthy, then it’s not glamping. Rule #1 of creating atmosphere: lighting, lighting, lighting. For a bright, twinkling look, go with LED string lights. For something a little softer, try translucent globe lights. 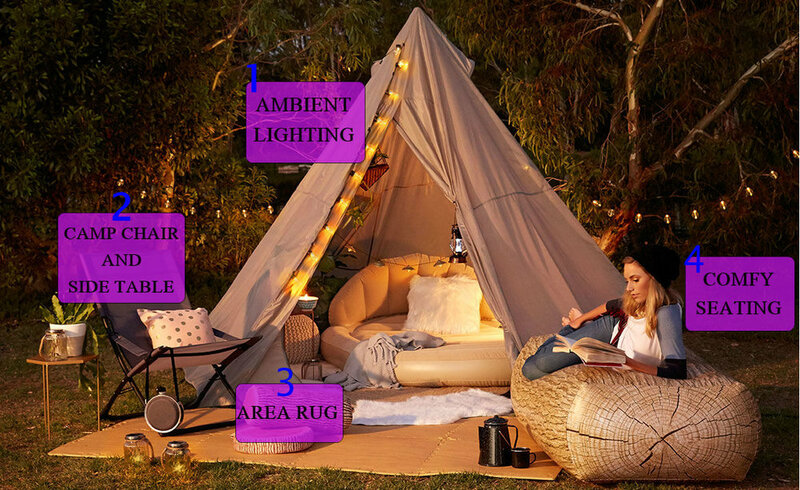 Combine with small hanging lanterns and the occasional flameless candle inside a mason jar, and you've created the perfect mood lighting for a luxurious glampsite. You can't go camping (or glamping) without a good, reliable camp chair. This is the chair you can drag back and forth from the fire at night to the shady spots during the day without worrying about a little bit of dirt. Bonus: most camp chairs have cup holders... just what the glamper ordered. If not, pair it with a small, but sturdy, side table to hold your belongings. Gone are the days when rugs were meant only for indoors! Drag that area rug outside to create a beautiful, homey footprint for your tent or yurt. Placing several more around the area of your site will prevent dirt from being kicked up and tracked inside. They also create a nice flat area for your tables and chairs. The more seating, the better. For lounging, toss down a bean bag, a large pouf, or an inflatable chaise. Be sure to complement it with a soft blanket and some throw pillows for added comfort. If there is one thing every tent or yurt absolutely needs, it's hanging decorations. It doesn't matter what it is... bunting, tassels, framed photos, posters, tapestries, even a chandelier. Deck out your living space with anything and everything you consider beautiful. If you've been rolling out a sleeping bag on your bed... that's not glamping. If your bed isn't simply overflowing with decadent pillows, comforters, and throws... that's not glamping. If you lay down on your bed and don't immediately think that you're back at home... that's not glamping. 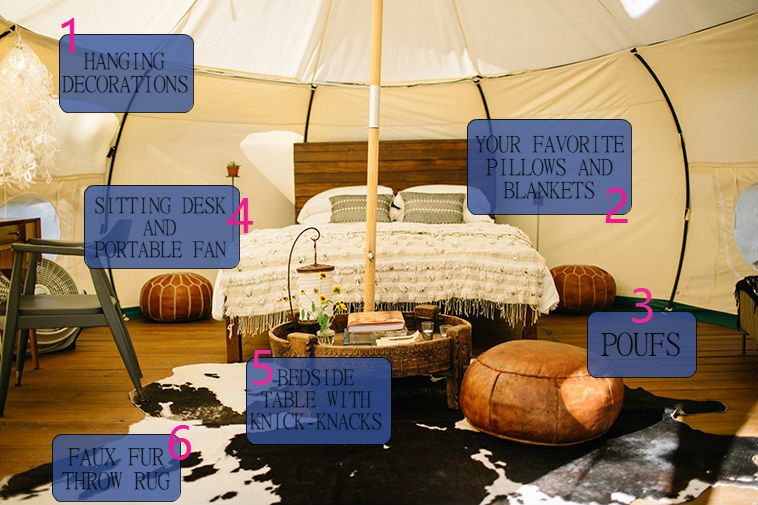 Pile that bed high with every soft thing you own -- that's glamping. Poufs. Everywhere poufs. Big poufs, little poufs, decorative poufs, sitting poufs, handmade poufs and store-bought poufs. POUFS. This one is optional, but highly recommended. Even if it's just a small vanity where you can sit and do your makeup, having a sitting area in your tent is great. Be sure to place a small fan beside it so you keep the air circulating throughout your space. For your books, lamps and lanterns, flower vases, and portable speaker, have a nightstand or an ottoman at the foot of the bed. If you pick the right piece of furniture, it doubles as fantastic storage for clothes and other items. Emphasis on the 'faux,' of course, but having an area rug is an absolute must. Inside and out, rugs are a glamping staple: they tie the room together as well as provide a sense of homey comfort. Faux sheepskins draped over chairs and ottomans is my current aesthetic. Such luxury!